Oli McBurnie is hoping a scoring spree could inspire a late Swansea City Championship play-off push. The Scotland international missed a penalty against Bolton Wanderers but then found the target late on to send Swansea on their way to a 2-0 victory. The 22-year-old is enjoying an impressive campaign - but is desperate to finish with a flourish. "That's 18 for the season - that's not too bad. I'll keep going now and see where I can get," McBurnie said. The victory lifts Swansea to within seven points of the Championship play-offs berths. "It's my first full season in professional football. I think I got nine (for Barnsley) from February last year until the end of the season, so if I got that many again it wouldn't be bad," he added. "The 20 goal mark is well within my sights but I don't have targets. I just try to score every game and see where it gets me. "We would love to try to sneak into the play-offs. "That's always going to be a target for us but there's no expectation or anything like that from the gaffer of the staff." 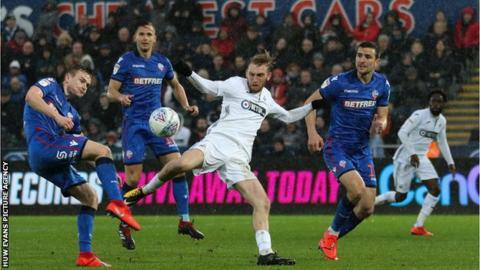 McBurnie drilled the ball home 10 minutes from time against a Bolton side who had been reduced to nine men eight minutes earlier. Bersant Celina then finished coolly in stoppage time to secure victory for Graham Potter's team. McBurnie's first-half penalty was saved by Bolton keeper Remi Matthews. That was the second time the Scot had been denied from the spot this season, while Wilfried Bony also missed against Aston Villa on Boxing Day. McBurnie insists that despite the failures, he will step up when Swansea next get a penalty. "I have got 100% confidence in myself and the boys have got 100% confidence in me taking them so it's not an issue really," he added. "Luckily I got the goal to make up for it. I haven't celebrated like that for a while. It was pure relief and emotion."